DJ and producer Toddla T returns to Tramlines Festival, Sheffield, with an expanded dance music programme and the Toddla T Sound show. For the first time ever, Toddla T has curated the festival’s opening Friday night (July 19) where the ‘steel city’ meets the ‘motor city’. Toddla T brings you Sheffield Vs. Detroit featuring the Detroit’s Theo Parrish, Maurice Faulton, plus Sheffield’s Forgemasters and Chris Duckenfield. 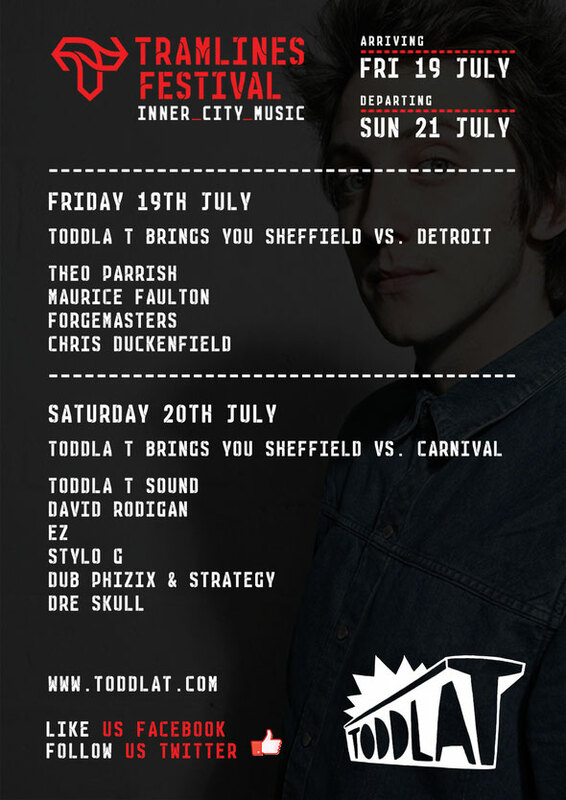 Saturday July 20 sees a different musical twist as Toddla T brings you Sheffield Vs. Carnival with the return to Tramlines of Toddla T Sound, bridging the gap between his DJ sets and full out live show. It features elements of both live performance and DJing with vocalists Shola Ama, Serocee and DRS. They are joined on the line up by the UK’s EZ, Tramlines’ David ‘Ram Jam’ Rodigan MBE, Dub Phizix & Strategy, Stylo G and New York's Dre Skull.